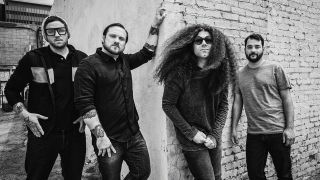 Coheed And Cambria are expected to release a new studio album later this year after signing with Roadrunner Records. To mark the announcement, vocalist and guitarist Claudio Sanchez, guitarist Travis Stever, bassist Zach Cooper and drummer Josh Eppard have released a mysterious video trailer which can be seen below. Coheed’s last album was 2015’s The Color Before The Sun. The band will embark on a co-headlining tour with Taking Back Sunday and The Story So Far across the US this summer.